A Nollywood movie titled 'Dr Bello' will be making history as the first Nigerian movie to debut in the U.S. theatres on Feb. 22, its producer, Mr Tony Abulu, has said. Abulu on Monday in Abuja said that the movie would be released in the U.S. theatres from Feb. 22 to Feb. 27. He said the movie, worth N150 million, would explore the foreign exchange potentials that abound in the U.S. film industry. The development, according to Abulu, will also create a platform for other Nigerian movies to sell in the U.S. market. "This is the second largest theatre chain in America with over 5000 screens and this portends great opportunity for Nigeria, because apart from "Dr Bello" other movies can come through this same agreement. "The only catch is that they have to be very well produced and they have to be targeted to an American audience, not all the Nigerian movies can do it; there will be a select group of Nigerian movies that can come through that channel. "But I think, as time goes on, we can begin to see the millions of dollars of foreign exchange revenue that we have been hoping for from a place like the U.S."
Abulu praised the performance of the Nigerian film industry in projecting the image of the country overseas, adding that the quality of movies currently produced in the country were encouraging. "The kind of movies we are making now are the quality of movies that I believe can have the capabilities to disclaim in the US theatres, but one of the prerequisite is that Americans would normally like to see one or two of their own actors in the movies. "So we have very good film makers in Nigeria and I can account for at least about 25 of them that I think have the capacity and capability to make such films. " The producer said that the production of the film was supported by Federal Government's $200 million intervention fund, adding that an endowment fund was still needed to boost activities of the entertainment industry. According to him, the AMC agreed to expand the film to a wider release if there was a strong performance during the critical make-or-break first week of its release. Abulu, who is also the writer and director of "Dr Bello", said that the release of the move in U.S. would strengthen the Nigerian film industry. He said that it would provide better opportunities for professionals in the industry as well as enable films get more elaborate in terms of their scope. "Once the revenue begins to increase of the films, everybody benefits. "The industry gets stronger because there is more funding in the industry, producers now can spend more money in making movies. "Instead of making movies at an average of N5 million, now you are making movies at an average of N40 million. "That means locations are paid for, actors and the entire crew are paid more for their work and they can bring in a lot more actors in the movies and the movies can get more elaborate in terms of their scope. "So by extension, a lot of people will benefit just by distributing the Nollywood movies in the U.S. market." "The cure for cancer has been found in the sky mountains of Africa and an American oncologist will risk everything to find it." 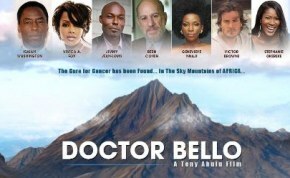 The movie, 'Dr Bello', will be starring Isaiah Washington, Vivica Fox, Jimmy Jean-Luis and Nigerian superstars Genevieve Nnaji and Stephanie Okereke. The film will open at AMC theatres in New York, New Jersey Philadelphia, Baltimore, Washington DC, Atlanta, Charlotte, Houston, Dallas, Miami and Jacksonville. Others are Columbus, Chicago, Detroit and Los Angeles.